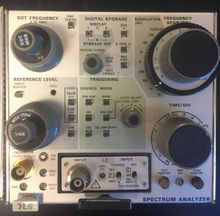 The Tektronix 7L5 is a low frequency (10 Hz – 5 MHz) spectrum analyzer plug-in for 7000-series scopes. It has built-in digital storage so it will work fine in non-storage mainframes, such as the large-screen 7603. It also features digital scale and marker level/frequency (6 digits) readout, and a "max hold" function.